And with the pops of hundreds of champagne bottles, the Wesleyan University Class of 2018 is done with their theses. 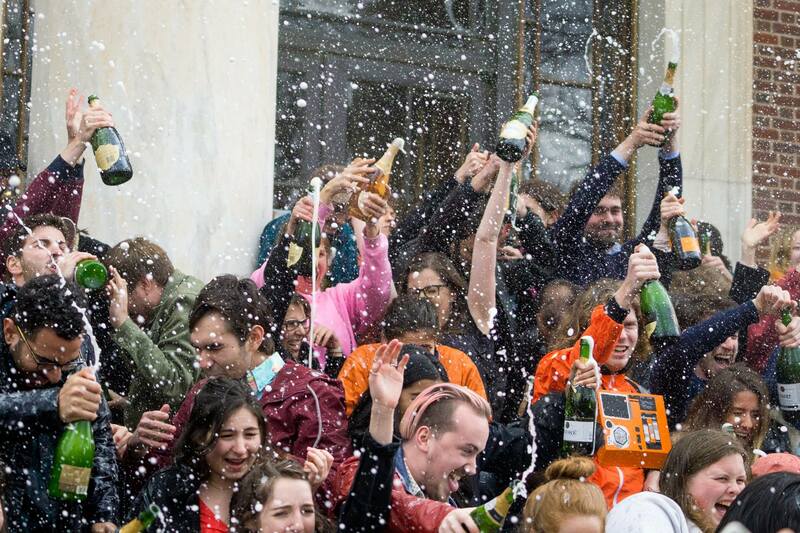 Shortly after the champagne popping, the sound of the fight song rang through campus. Hours later, the Olin steps were still drenched with champagne, and smelled like the aftermath of a Fountain house party (but maybe a little more wholesome). Congratulations to all of the senior thesis writers. What you’ve all accomplished is a feat, and has inspired so many of us to consider writing theses. To everyone that asked for a thesis crazy interview, thank you for letting us get a glimpse into your lives. We did 48 interviews this year, a new record. Our transcribing fingers are extremely tired. Posted by sdz on April 18, 2018 at 11:24 AM.